Visitors to the Yoko Ono show in London may well come away with a piece of debt to the redoubtable artist. To be precise that would be a jigsaw piece of debt. Early in her show at Serpentine hang some half a dozen WWII helmets filled with segments of a giant puzzle. You can guess the overall picture from a glance at any one of them. Were these pieces fit together again, the pattern to emerge would be blue and fluffy bits of white. It’s an invitation to think of a line by Yoko’s husband, “above us only sky”. Gallery notes indicate that the artist hopes her visitors will get together with their individual pieces and recreate this map of the heavens. That is really blue sky thinking. But we won’t of course, not in this life. Our single pieces now serve only to remind us of how atomised and unknown to one another we remain. The ironic twist is that military uniforms bring people together a lot more definitively than exercises in what you might call relational aesthetics. Nevertheless, the broken blue pieces and the grim metal lids make for a poetic juxtaposition. The same quality of patience is perhaps required to do a puzzle and to negotiate a truce. On the back of each piece are the artist’s inititals. You may now feel you own an orginal Yoko Ono artwork, but you don’t of course. This is very much an indefinite loan. 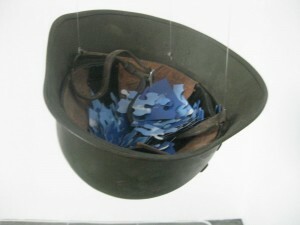 Yoko Ono: To the Light can be seen at Serpentine, London, until September 9 2012. See gallery website for more details. It is a good show IMO but that won’t stop you from enjoying this savaging in the Independent.